A new search engine is making waves around the Internet, and it is called Cuil (www.cuil.com). The undercurrent seems to be setting Cuil up as the next big search engine. My first reaction was “come on, no one can beat Google“, but I then remembered that I was saying the same thing about Yahoo when Google arrived. I really like the layout of the Cuil search results. The multi-column approach is much cleaner look with refined key word, or grouping, choices along the top and categories on side. I also like the embedded images with the snip of text from the target site. The lack of advertising is refreshing but I wounder just how long that will last. Note: The wider the display, the better the site looks. I found that the Cuil site was slow and quirky. This is expected as they are experiencing a huge increase in traffic compared to their pre-buzz days. I searched Cuil and Google with the same set of search terms, and as of right now, I am staying with Google. I do not know if it is the maturity of the Google search algorithms or the fact that Google has been tracking my every search for the last couple of years, but Google’s search results were far more relevant. 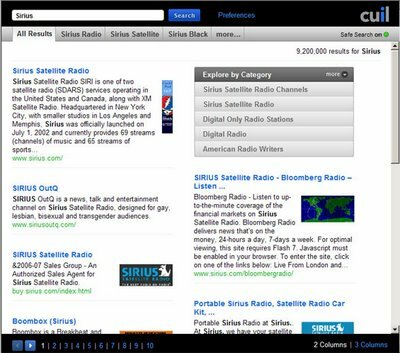 I was very surprised to see the search term “Sirius merger” (without the quotes) brought up zero results on the Cuil search engine, but then again, maybe it is just a load issue. “Sirius +merger” reported to bring up 91 results but nothing ever displayed in the page except for the total number of results. Again, this may all be load issues. In contrast, Google and Yahoo brought dozens of listings for both search terms. I think Cuil has potential but it looks like this may still be at an early Beta stage and not ready for prime time. This site is going on my favorites as I believe it could have a promising future. Google should take note of Cuil. I think their user interface is superior to that of Google and Google should allow users to completely opt-out of all activity tracking if they so choose (note: Google will anonymize their logs, eventually). Cuil must work on site performance and search relevance. Just because you index more pages, does not mean you are the “better” search engine. For your reference here are a few other articles about the Cuil.com.